Zenbox’s slogan really says it all: “Hide the mess behind the desk.” As a dedicated throw-everything-in-the-closet-and-slam-the-door-before-it-falls-out practitioner, I can get behind this 100%. The Zenbox is a dock for your MacBook Pro: you plug one end into the left side of your Mac, and plug your various peripherals into the other. The USP of this dock over others is that those peripherals sit at the end of a cable, letting you throw all of your junk behind the desk and only have to deal with one tidy box. 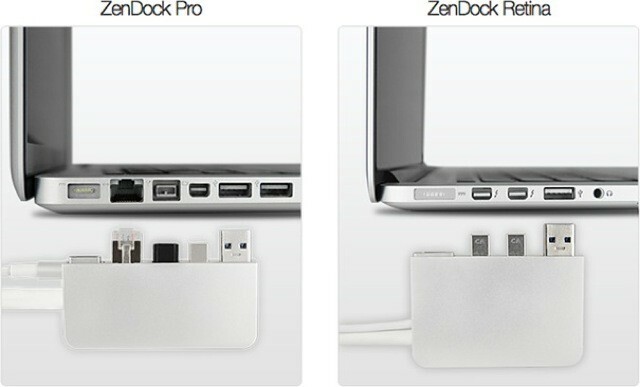 The Zenbox comes in two versions, one for the Pro and one for the Retina Pro. Sadly, likely thanks to the fact that it spreads its ports across both sides, there’s no version for the Air. Sad, as this is the MacBook most likely to need external hookups. The Zendock Retina comes three USB ports, mic and headphone jacks and a Mini DisplayPort socket, along with a Thunderbolt passthrough. The Pro adds an Ethernet port and FireWire, and both have a clever clip to hold the Magsafe adapter. If I had a Pro, I’d be on this brushed metal on the early 2000s-era OS X UI. The price might be the only sticking point: RRP is $179, although you can pitch $139 on Kickstarter and also be one of the first to get a unit if and when they ship. Now, you’ll have to excuse me. This post has made me rather embarrassed about the mess behind my desk.